I have two sister-in-laws that are expecting right now, so I'm starting to think about baby gifts. I thought as part of the gift I'd give a plain onesie an extra sweet touch by embroidering a design on it. This is a really simple project, probably one that most people know how to do, but it was new to me. Here's a short tutorial. First, find cheap onesies. I purchased mine through a mom bargain site so they were super cheap, but a bit higher quality than just the Gerber brand you can buy at the craft store. Also purchase waste canvas. You can find this at the craft store. Hoop your onesie and waste canvas. Now you are ready to embroider. I actually used a small cross stitch pattern that came on the back of the waste canvas package. I didn't want anything too large, but you could definitely do more than I did. Once you are finished with your design you can take the hoop off, cut off the excess canvas and start pulling out the strings. I ended up grabbing a pair of tweezers to help pull the final strings out. I think it's nice to add a little personal touch. Especially to something that ought to get a lot of use. There you have it. Have a Happy Day! oh my goodness... super neat... great tutorial i have always wondered how to get the embroidery on to fabric!!! Thanks! Wow, you know, I've never embroidered anything on a onesie before. In fact, I don't think I've ever embroidered anything...but it doesn't look so daunting now. This was a great idea, and great tutorial. that's a great technique you're using, makes it pop out! I'm tempted to try too! What a fabulous idea! I just found out my sister in law is expecting as well and I can't wait to be an auntie! I might have to try this project! Thanks for the inspiration! Adorable! I've never tried this technique. What a neat idea! Love personalize gifts! Cute idea! I'm dying to know what that bargain site is... I make appliqued onesies for my Etsy shop, SweeterThanSweets and am always looking for good prices on onesies. What a fantastic idea. Thank you so much for sharing your wonderful idea. What a sweet gift and you are so smart for thinking about it! I've always wondered how people do that! so cool!! 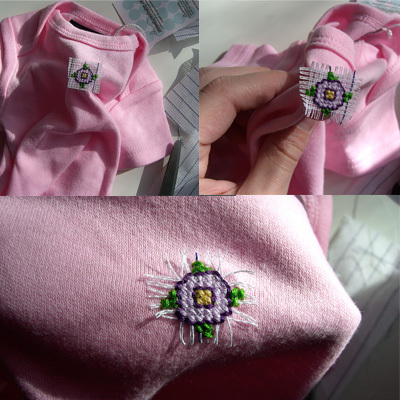 I used to embroider on my daughter's clothes. It adds a nice touch! What a great idea & nice tutorial. LOVE IT - Great job and I like how the pictures were used for a guide. Thanks for the Tutorial. Great idea. I love the background on your blog! That is SO awesome!! I want to try my hand at that some time! so THATS how it's done!!! Cool idea and love it!!!! great job on a great tutorial as well! Thanks for giving us the tutorial! Very nice lesson! I don't embroidery anymore but you make it look easy! Lovely!!! I love cross stitch!!! What a darling idea. They'll love them. Adorable! I love tutorials... gets me motivated to create! Wonderful tutorial, thanks for sharing! I cross-stitched a horse head to the back of a jean jacket once. I wish the jacket still fit-it's hard to part with something I spent so much time on! Very cute. I'm going to follow your blog and add you to mine. great tutorial, who knew it was so easy?? might have to give it a try with my new neice and nephew. This is such a great tutorial! Thank you for sharing! !